Supports Glutathione Production* Alpha Lipoic Acid (ALA) is naturally produced in the human body in very small amounts, but is also available through food sources. ALA is unique because it supports the body's free radical scavenging systems and can function in both water and fat environments. * ALA can also recycle the antioxidant Vitamins C and E, thereby extending their activities. * Natural color variation may occur in this product. Take 1 capsule daily. Store in a cool, dry place after opening. Supplement Facts Serving Size: 1 Veg Capsule Servings Per Container: 120 Description Amount per Serving % Daily Value * Percent Daily Values are based on 2,000 calorie diet.† Daily Value not established. 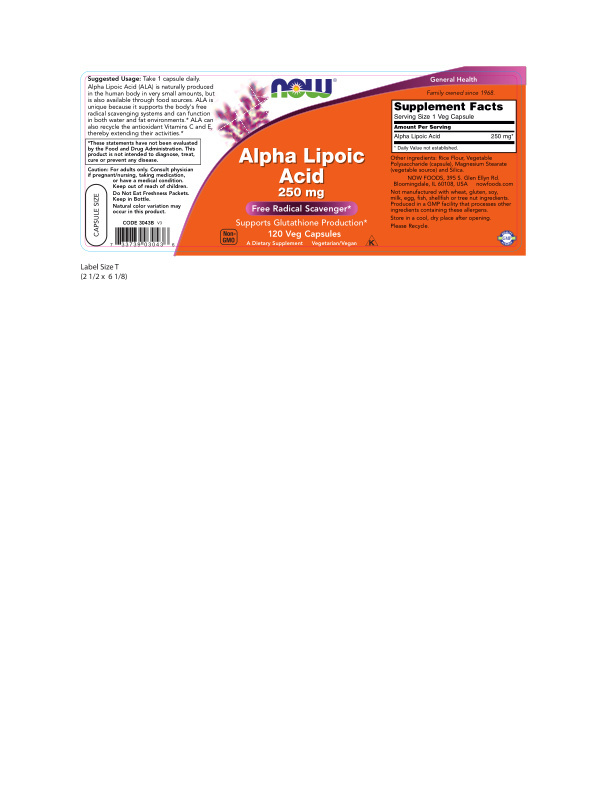 Alpha Lipoic Acid 250 mg † Other Ingredients: Rice Flour, Vegetable Polysaccharide (capsule), Magnesium Stearate (vegetable source) and Silica. Not manufactured with wheat, gluten, soy, milk, egg, fish, shellfish or tree nut ingredients. Produced in a GMP facility that processes other ingredients containing these allergens. Caution: For adults only. Consult physician if pregnant/nursing, taking medication, or have a medical condition. Keep out of reach of children. Do Not Eat Freshness Packets. Keep in Bottle. Store in a cool, dry place after opening. Please Recycle. Natural color variation may occur in this product. Family owned since 1968. *These statements have not been evaluated by the Food and Drug Administration. This product is not intended to diagnose, treat, cure or prevent any disease. For adults only. Consult physician if pregnant/nursing, taking medication, or have a medical condition. Keep out of reach of children. Do not eat freshness packets. Keep in bottle.